Carspring is an online used car dealership, who began trading in May 2015. 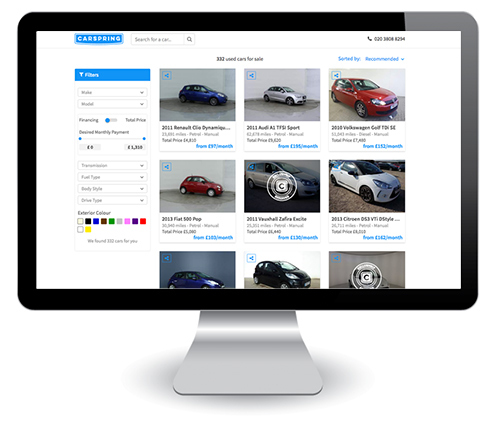 The company’s online dealership model is unique to the UK used car market. Customer’s log on to their site, decide on the car they want, before having it delivered to their door. And, a unique model presents unique challenges. A car is the second largest purchase a consumer generally makes after buying their house. This inherently means customers need a high level of information and confidence about the car they’re buying. In the online space, this need is only accentuated. And, although the company does offer a 14-day period, in which customers can return the car, the nature of the online model means the new owner doesn't get to see it before delivery. So, in order to allay risk perceptions, the company has gone about implementing an information-based content strategy. This means the company provides customers with different layers of information to guide them through the decision journey. The most critical layer of this information is when the customer has decided on the specific model they’re after, on the product detail page. This is the key decision moment, in which they’ll either complete a finance application or look elsewhere. It’s also where MotorSpecs comes in. 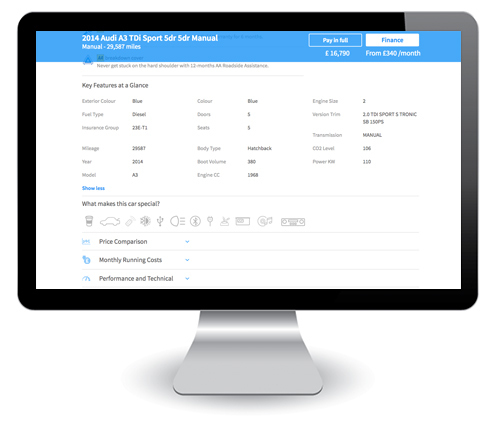 These detailed specifications give the consumer the peace of mind they need to complete their purchase. Without this level of detail, getting them to convert could be a real problem. It’s something that Maximillian is candid about, “MotorSpecs isn’t just good for business, it’s vital. As with the automotive retail sector generally, value for money is a key concern for Carspring customers, "information such as insurance group, miles per gallon and tax band generally form the basis of consumer preferences in our industry, we get all these from MotorSpecs." For those who are more concerned with the performance, MotorSpecs also provide everything from top speed and 0-60mph to transmission and engine size, which are other vital points of decision. And, it's about more than just information on the website. It’s also about providing customer service agents with the knowledge and expertise they need to guide customers through buying. Customer service is key for such a high-ticket purchase, with a long and complex buying journey presenting a huge number of touchpoints. It’s another area where Carspring utilises the power of MotorSpecs, “Clearly, it’s [MotorSpecs is] great for our customers. But, it also gives our staff all the knowledge they need to provide full support, throughout the full journey.” When it comes to bringing up details about a specific car, it’s the data from MotorSpecs that allows the support team to talk with a level of authority and expertise on the granular details of a given model. The fact they can rely on the information is essential in them having the confidence to do their job effectively. The result? "An authoritative customer service team both supports our customers and builds our brand." In this information age, where knowledge is power and power is money, MotorSpecs is one of the central partnerships that’s driving this innovative startup forward. And, with huge success. After a nationwide TV campaign and near-exponential growth in monthly sales, concerns that selling cars online was a step too far seem somewhat unfounded. And, in part, that’s down to MotorSpecs.